Background: Male breast cancers (MBCs) are uncommon and account for 1% of all breast cancers. Medical conditions that increase the estrogen to testosterone ratio are implicated as the risk factors. Morphologically similar, but MBCs have biological differences compared with female breast cancer (FBC). Purpose: The present study was aimed to examine the immunophenotype of MBC, subsequent molecular subtypes, their association with clinicopathological features, and prognosis. Materials and Methods: We analyzed clinicopathological features of 42 cases of MBC, and classified them according to molecular classification using immunohistochemistry (IHC). This is the second largest study from India. Results and Conclusion: Median age of patients was 61 years (age range: 41-87 years). Invasive duct carcinoma comprised 95.2% of cases. Tumor grade II and III was seen in 50% and 47.6% of cases, respectively, and advanced stage disease (III/IV) was seen in 45.2% cases (n = 39). Estrogen receptor (ER) was positive in 97.6% cases, progesterone receptor (PR) in 83.3%, androgen receptor (AR) in 76.2%, HER2 in 4.8%, Cyclin-D1 in 92.9%, Bcl2 in 66.7%, GCDFP-15 in 23.8%, p53 in 16.7%, and Ki67 index was low (<14%) in 66.7% cases. Molecular subtyping of these cases revealed 64.3% of luminal A, 35.7% of luminal B, and no HER2 rich/driven category or triple negative case. There was no statistical significance between luminal A and B category pertaining to overall stage of tumor (P = 0.905). Lymph node metastasis was more commonly associated with luminal B category (P = 0.089). p53 positivity showed significant association with luminal A cases (P = 0.002) and nodal metastasis (P = 0.042). GCDFP-15 positivity showed significant association with higher tumor grade (P = 0.042) and stage (P = 0.047). Stage was the most significant prognostic marker (P < 0.0001). On follow-up (n = 27), all the six cases that showed recurrence/persistent disease were high stage (III/IV) on presentation. Male breast cancer (MBC) is a hormone-driven disease, which accounts for 0.5--1% of all breast cancers. Although uncommon, it is often detected in advanced stages with lymph node metastasis and is a significant cause of morbidity and mortality in men.,,,, Although there are many similarities including the prognostic features between MBC and female breast cancer (FBC), they are in fact biologically quite different. Currently, treatment regimens for MBC have been extrapolated from the extensive literature and clinical experience pertaining to those of FBC., In our study, we analyzed the immunophenotype of MBC, and its correlation with clinicopathological characteristics and prognosis as an effort towards better understanding of the pathobiology of MBC. During 2011-2016 (5.5 years), 42 cases of MBC were diagnosed in the histopathology department. We studied the immunophenotype of MBC, categorized them into molecular subtypes based on the immunohistochemistry (IHC) profile and analyzed their association with demographic profile, clinicopathological features, and prognosis with the median follow-up of 28.6 months. The surgical samples comprised of core needle biopsy, lumpectomy, and mastectomy specimens, which were obtained in-house with cold ischemia time of less than 30 min. Specimens were fixed in 10% neutral buffered formalin, in a volume equivalent to 10 times that of the tissue. Fixation time varied between 6 and 72 h. Samples were processed in isopropyl alcohol and xylene, embedded in paraffin and subsequently cut to 4-micron thickness sections. The slides were stained with hematoxylin and eosin for histopathological diagnosis. IHC staining was performed on Ventana Benchmark XT autostainer (Roche, U.S.A.) as per manufacturer's recommended protocol for estrogen receptor (ER), progesterone receptor (PR), HER2, androgen receptor (AR), GCDFP-15, Cyclin-D1, Bcl2, p53, and Ki-67. Equivocal HER2 cases were subjected to FISH testing using Zytolight spec HER 2/CEN 17 dual color probe (Zytovision GmbH, Germany) as per manufacturer's instructions. ER, PR, and HER2 scoring (IHC/FISH) was done as per 2013 ASCO/CAP. 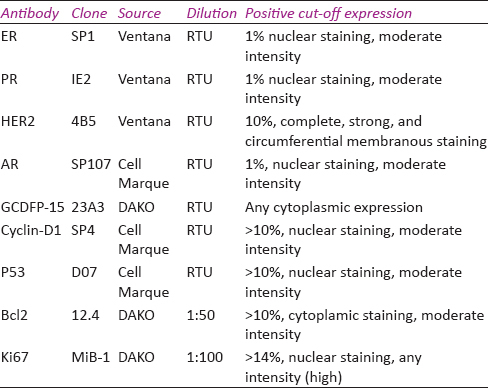 Details of antibodies, clone, manufacturer, dilutions used and significant cut-off expression criteria for IHC profile are tabulated in [Table 1]. Categorical variables were presented in number and percentage (%). Qualitative variables were correlated using Chi-Square test. A “P” value of <0.05 was considered statistically significant. The data was entered in MS EXCEL spreadsheet and analysis was done using Statistical Package for Social Sciences (SPSS) version 21.0. A total of 42 cases was included in our study. The demographic and clinicopathological features have been tabulated in [Table 2] and [Table 3]. Age range of patients varied from 41--87 years (mean age: 63 years; median age: 61 years). The most common histopathological diagnosis was invasive ductal carcinoma (IDC), seen in 40 cases (95.2%), followed by one case (2.4%) each of invasive lobular carcinoma (ILC) and invasive papillary carcinoma (IPC). According to the modified Bloom and Richardson score, most of the cases were grade II (50%) and 47.6% of the cases were high grade (grade III). Data on lymph nodal metastasis was available in 36 cases, systemic metastasis in all 42 cases, and staging could be done in 39 cases. Lymph nodal metastasis was seen in 58.3% cases (21/36), and systemic metastasis in 11.9% cases (5/42). Advanced stage disease (stage III and IV) was seen in 48.7% cases and early stage disease (I, II) in 51.3% cases. Majority of cases were in stage II (19/39, 48.7%), followed by stage III (14/39, 35.9%), IV (5/39, 12.8%), and stage I (1/39, 2.6%). All the cases were positive for hormonal markers, ER in 97.6%, PR in 83.3%, and AR in 76.2% [Figure 1]a,[Figure 1]b,[Figure 1]c. Only one case was ER negative but showed PR expression. HER2 was positive in only two cases (4.8%), which were confirmed by reflex-FISH testing [Figure 2]a and [Figure 2]b, and show concomitant ER/PR positivity and none of the case was of HER2 rich/driven category. AR was positive in 75% of IDC, and in each of the cases of ILC and IPC (P = 0.720). Most of the cases showed positivity for Cyclin-D1 [Figure 3]c and Bcl2, with values of 92.9% and 66.7%, respectively. 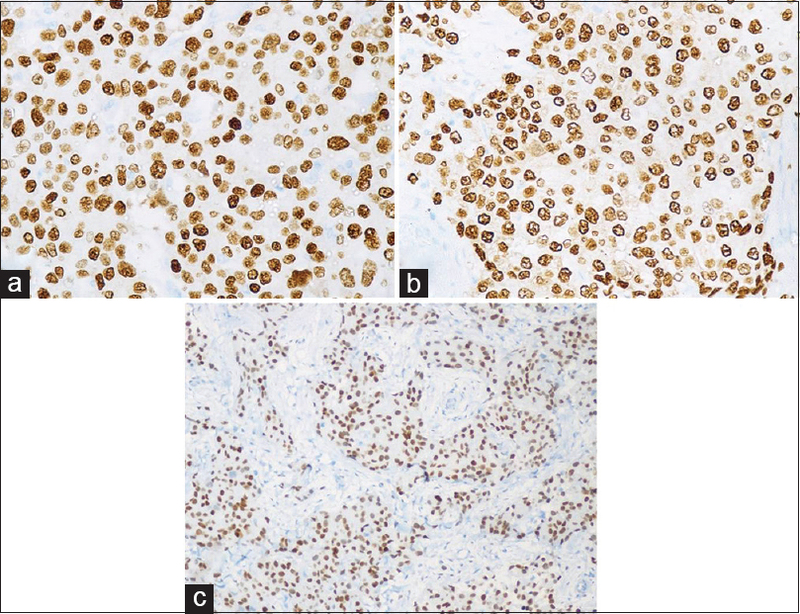 IHC for GCDFP-15 and p53 [Figure 3]a and [Figure 3]b showed positive expression in 23.8% and 16.7% of the cases, respectively. Ki-67 index was low (<14%) in 66.7% cases [Figure 3]d.
Molecular subtyping based on the IHC profile of cases is tabulated in [Table 4]. Luminal A and B comprised of 64.3% and 35.7% of the cases, with no triple negative breast cancer (TNBC) and HER2 rich/driven case. Among the IHC markers applied, negative p53 expression correlated significantly with the molecular subtype luminal A (P = 0.002). p53 positivity showed statistically significant correlation with nodal metastasis (P = 0.042), whereas all cases with absence of nodal metastasis were p53 negative. GCDFP-15 positivity correlated with lower (grade I/II) tumor grade (P = 0.042) and advanced disease stage (P = 0.047). Absent and limited (N0 and N1) nodal metastasis correlated with positive Bcl2 (P = 0.022). AR showed no correlation with lymph node metastasis, stage, or response to therapy. No correlation of tumor size (T stage) with any IHC marker was observed. All cases (n = 5) with systemic metastatic disease were negative for cyclin D1, which was not significant (P = 0.509). Luminal-A MBC had grade II tumors in 55.5% of the cases, whereas 60% of luminal B cases had high-grade III tumors (P = 0.412). Nodal metastasis was seen in 47.8% and 76.9% of luminal A and B category (P = 0.089). There was no statistically significant difference between age groups, tumor size, grade, or stage between luminal A and B category. Post treatment follow-up of the cases was available in 27 cases, of which 77.7% had no evidence of disease (NED), whereas 22.3% cases had recurrence/persistent or progressive disease. All the early stage cases, only 40% of the advanced stage cases, showed no evidence of disease on follow-up. Recurrence was seen in three cases, and included metastatic deposits to bone, lung, and lymph nodes. Hence, staging was the strongest prognostic factor (P < 0.0001). MBC accounts for around 0.5--1% of all diagnosed breast cancers. The incidence of MBC is low compared with FBC, but recently has shown a gradual rise. The protocols of management are largely emulated from the experiences of the treatment of FBC. The incidence of MBC rises steadily with age, but does not show the bimodal pattern as seen in FBC.,, The median age reported is 63--67 years in various studies, ranging from 30--97 years, which is typically 10 years older than that seen for FBC.,,, A similar median age of 63 years was seen in our study. As in females, tumor grade is a powerful prognostic factor. Grade II tumors are more commonly seen in MBC, quoted as 40%--59.3%.,, Some studies had higher number of grade III tumors (73%). Surveillance, epidemiology, and end results (SEER) database (between 1973 and 2000) reported 39% of grade III tumors, comparable with the proportion in postmenopausal women, but less than that in premenopausal women.,,, Our study had slightly more number of grade II tumors (50%), compared with grade III (47.6%). In few studies,, median survival has shown to be significantly adverse in higher grade tumors (grade III); however, in our study no such significant correlation was seen between tumor grade and outcome (P = 0.535). As compared with FBC, many studies of MBC have shown a higher rate of ER and PR positivity, whereas considerably less HER2 over expression/amplification and TNBC.,,,,, In the National Cancer Institute's SEER database between 1973 and 2005, 92% of the MBCs, but only 78% of FBC, were ER-positive. In the presented study, ER and PR were positive in 97.6% and 83.3% of the cases, whereas HER2-positive cases were only 4.8% with no HER2 rich/driven or TNBC case. This result is similar to the study published by Korneegoor et al.,who has evaluated 134 cases of MBC and found positive ER, PR, and HER2 in 94%, 68%, and 3%, respectively, with no HER2 rich/driven caseand 4% TNBC. Lacle et al., evaluated immunophenotype in 151 cases of MBC and found positive immunoexpression for ER, PR and HER2 in 90%, 66% and 3.3% of cases, respectively, similar to the results in our study. Few immunophenotyping studies on MBC have demonstrated HER2+ cases in about 15% and even more.,, The variation in percentage of positive HER2 cases may be attributed to differences in antibody clone, preparation, scoring systems, and cut-off values. One study of MBC, Gogia et al., has shown unusual high incidence of TNBC and HER2 positivity of 19% and 28%, respectively, whereas the ER positivity was 78%. Overexpression of HER2 is a well-known prognostic factor associated with poor survival in FBC; however, data regarding the association of HER2 positivity and survival are limited and contentious in MBC as per the prevailing literature. MBCs have failed to show association between HER2 overexpression and nodal metastasis, a potential unfavorable prognostic factor,, In the presented study, both the HER2+ cases were of higher stage (III/IV) on presentation, however, lost to follow-up. Studies have documented that vast majority of the cases are luminal A, followed by B, whereas negligible/absent HER2 driven/rich or TNBC/basal-like category.,,, Results in the presented study are also similar. FBCs have lower frequency of luminal A (51--69%), but higher frequency of TNBC/basal like (12--21%) and HER2 rich/driven (7--12%) subtypes. It is unknown whether the paucity or absence of the above unfavorable breast carcinoma subtypes in males is associated with a favorable prognosis. Luminal B category cases are more frequently associated with higher nuclear grade and increased nodal metastasis, an unfavorable factor in both MBC and FBC., Our study has also shown this trend, but it was not statistically significant. 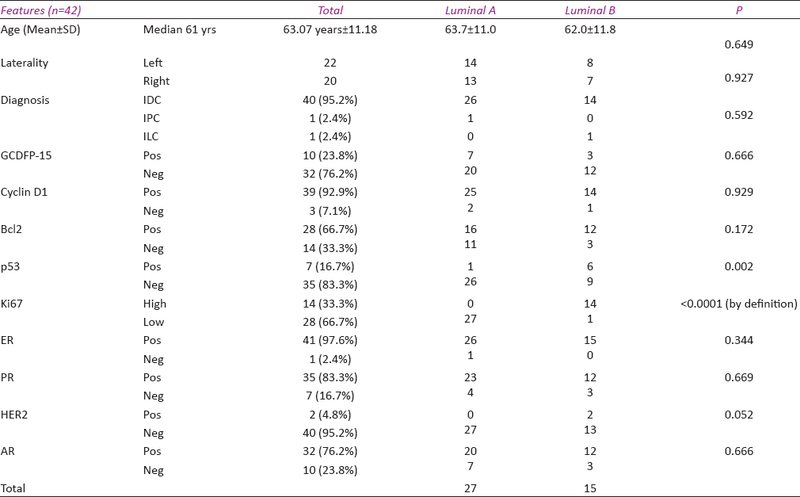 Nodal metastasis was seen in 47.8% and 76.9% of luminal A and B category, respectively, however not statistically significant (P = 0.089) in the presented study. Ge et al. also reported more nodal metastasis in luminal B (71%) compared with luminal A (41%), however not statistically significant. In presented study, negative GCDFP-15 correlated with higher tumor grade (P = 0.042) and early disease stage (P = 0.047). Korneegoor et al. found GCDFP-15 + tumors significantly associated with lower mitotic activity (P = 0.038) and axillary lymph nodal metastasis (P = 0.001). In one study, overexpression of cyclin D1 correlated with better outcomes. In our study, all cases with systemic metastatic disease were negative for cyclin D1, however not statistically significant (P = 0.509). Korneegoor et al. found cyclin D1+ tumors to be associated with smaller tumor size (P = 0.008), but no such correlation was found in our study. Bcl2 is well known as an antiapoptotic oncogene in lymphoma; however, the paradoxical function of the tumor suppressor gene has been reported in breast cancer. In our study, positive Bcl2 expression was associated with absent and lesser lymph nodal metastasis (N0 and N1) and was statistically significant (P = 0.022). Korneegoor et al. found Bcl2+ tumors were associated with smaller tumor size (P = 0.017), but no such correlation was found in our study. In our study, p53 positivity showed statistically significant correlation with nodal metastasis (P = 0.042). Study by Korneegoor et al. also revealed p53 positivity to be significantly associated with nodal metastasis (P = 0.010). In our study and study by Korneegoor et al., AR expression did not show any significant correlation with clinicopathological features. One study showed AR-positive luminal A MBC had improved OS compared with matched FBC cases. In a large study by Humphries et al., AR expression has been significantly associated with DFS but not OS, and this association remained upon multivariate analysis. AR is gradually being recognized as a potential target for therapy in both genders, with potential use of antiandrogen therapy to treat MBC. To summarize and conclude, the current study attempts to elucidate the clinical relevance of several biomarkers and characterize subtypes of MBC based on IHC profile. We found that the immunophenotype of MBC differ from those in FBC by having luminal A and B as extensive (>95%) subtypes. Although the study has shown some correlation between the immunosubtypes and clinical behavior of MBC; however, due to rarity of the disease and small number of cases in the study, the role of these biomarkers are yet to be defined with further larger studies required to attain more statistical power. The authors would like to acknowledge Ms. Sangeeta Arora and Mr. Arvind Bhuker for their technical assistance in performing immunohistochemical stains. Humphries MP, Rajan SS, Honarpisheh H, Cserni G, Dent Jo, Fulford L, et al. Characterisation of male breast cancer: A descriptive biomarker study from a large patient series. Sci Rep 2017;7:45293. Ruddy KJ, Winer EP. Male breast cancer: Risk factors, biology, diagnosis, treatment, and survivorship. Ann Oncol 2013;24:1434-43. Korneegoor R, Verschuur-Maes AHJ, Buerger H, Hogenes MC, de Bruin PC, Oudejans JJ, et al. Immunophenotyping of male breast cancer. Histopathology 2012;61:1145-55. Lauro LD, Barba M, Pizzuti L, Vici P, Sergi D, Benedetto Di A, et al. Androgen receptor and antiandrogen therapy in male breast cancer. Cancer Lett 2015;368:20-5. Ottini L, Capalbo C, Rizzolo P, Silvestri V, Bronte G, Rizzo S, et al. HER2-positive male breast cancer: An update. Breast Cancer: Targets and Therapy 2010:2:45-58. Lacle MM, van der Pol C, Witkamp A, van der Wall E, van Diest PJ. Prognostic value of mitotic index and Bcl2 expression in male breast cancer. PLoS One 2013;8:e60138. Masci G, Caruso M, Caruso F, Salvini P, Carnaghi C, Giordano L, et al. Clinicopathological and immunohistochemical characteristics in male breast cancer: A retrospective case series. Oncologist 2015;20:586-92. Ge Y, Sneige N, Eltorky MA, Wang Z, Lin E, Gong Y, et al. Immunohistochemical characterization of subtypes of male breast carcinoma. Breast Cancer Res 2009;11:R28. Anderson WF, Jatoi I, Tse J, Rosenberg PS. Male breast cancer: A population-based comparison with female breast cancer. J Clin Oncol 2010;28:232-9. Giordano SH, Cohen DS, Buzdar AU, Perkins G, Hortobagyi GN. Breast carcinoma in men: A population-based study. Cancer 2004;101;51-7. Muir D, Kanthan R, Kanthan SC. Male versus female breast cancers. A population-based comparative immunohistochemical analysis. Arch Pathol Lab Med 2003;127;36-41. Yu XF, Feng WL, Miao LL, Chen B, Yang HJ. The prognostic significance of molecular subtype for male breast cancer: A 10-year retrospective study. Breast 2013;22:824-7. Rudlowski C, Friedrichs N, Faridi A, Fuzesi L, Moll R, Bastert G, et al. Her-2/neu gene amplification and protein expression in primary male breast cancer. Breast Cancer Res Treat 2004;84:215-23. Gogia A, Raina V, Deo S, Shukla NK, Mohanti BK. Male breast cancer: A single institute experience. Indian J Cancer 2015;52:526-9. Kornegoor R, Verschuur-Maes AH, Buerger H, Hogenes MC, de Bruin PC, Oudejans JJ, et al. Molecular subtyping of male breast cancer by immunohistochemistry. Mod Pathol 2012;25:398-404. Li H, Yang Y, Wang D, Li Z, Zhang D, Xu F. Molecular subtypes of male breast cancer by immunohistochemistry. Int J Clin Exp Med 2017;10:1670-7. Kanthan R, Fried I, Rueckl T, Senger JL, Kanthan SC. Expression of cell cycle proteins in male breast carcinoma. World J Surg Oncol 2010;8:10. Shaaban AM, Ball GR, Brannan RA, Cserni G, Di Benedetto A, Dent J, et al. A comparative biomarker study of 514 matched cases of male and female breast cancer reveals gender-specific biological differences. Breast Cancer Res Treat 2012;133:949-58. Pich A, Margaria E, Chiusa L, Candelaresi G, Canton OD. 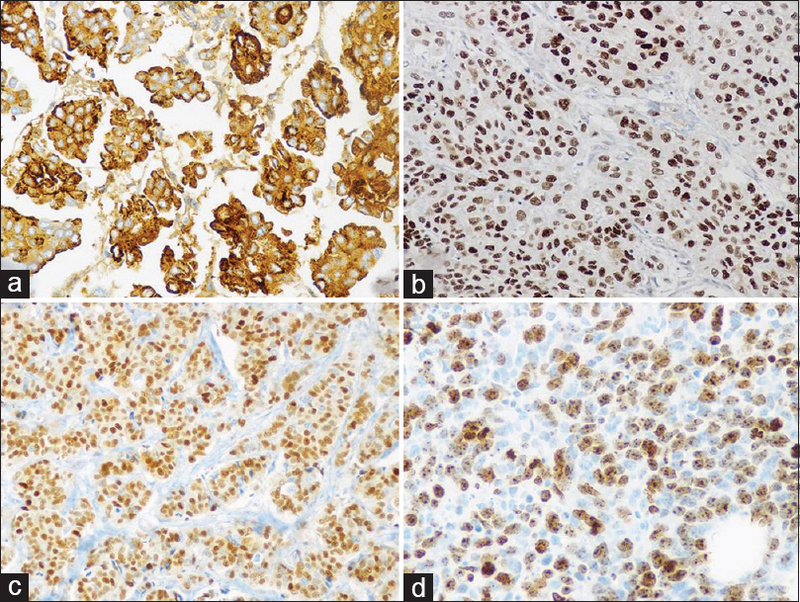 Androgen receptor expression in male breast carcinoma: Lack of clinicopathological association. Br J Cancer 1999;79:959-64. Murphy CE, Carder PJ, Lansdown MR, Speirs V. Steroid hormone receptor expression in male breast cancer. Eur J Surg Oncol 2006;32:44-7. Sasano H, Kimura M, Shizawa S, Kimura N, Nagura H. Aromatase and steroid receptors in gynecomastia and male breast carcinoma: An immunohistochemical study. J Clin Endocrinol Metab 1996;81:3063-7. Rayson D, Erlichmanc C, Suman VJ, Roche PC, Wold LE, Ingle JN, et al. Molecular markers in male breast carcinoma. Cancer 1998;83:1947-55. Wenhui Z, Shuo L, Dabei T, Ying P, Zhipeng W, Lei Z, et al. Androgen receptor expression in male breast cancer predicts inferior outcome and poor response to tamoxifen treatment. Eur J Endocrinol 2014;171:527-33.